A Japanese company dedicated to supporting people’s enthusiasm for travel has launched a unique service to help non-Japanese speaking tourists who want to experience traditional Edomae-style sushi in the Tokyo area. The service, launched Aug. 30 by Tabimori, Inc., is called “SushiUniversity,” and allows tourists to visit traditional sushi restaurants “with all the ease and familiarity of going to their favorite neighborhood restaurant.” The service was conceived to meet the desires of today’s travelers who, increasingly, are seeking more personal and more authentic experiences at their chosen destinations. While most travelers are familiar with sushi to one degree or another, higher-end sushi restaurants, particularly in Japan, tend toward “omakase,” or the “chef’s choice.” That approach can provide exciting surprises but may also prove intimidating to the uninitiated or less adventurous diners, in part because guests will not know which food items will be presented, or in what order. “Even if they like the dishes, they struggle to enjoy the cuisine on the level as the Japanese, who know about sushi culture and are able to communicate with the chef,” the company said in a news release announcing the program. SushiUniversity will help take the mystery out of that experience, making it more relaxing and enjoyable. 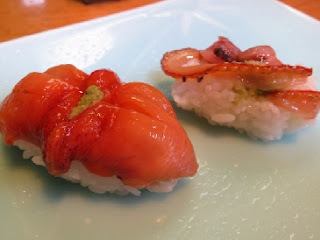 SushiUniversity is not affiliated with any particular restaurant, but showcases a number of establishments that specialize is Edomae-style sushi. Guests who enroll in the course will receive a copy of the omakse menu in advance of their visit in one of 12 languages: English, German, French, Italian, Spanish, Portuguese, Russian, Chinese (simplified and traditional), Korean, Thai and, of course, Japanese. “Understanding the various ingredients ahead of time and using interpreting allows diners to relax and enjoy the sushi before them in a natural and intuitive fashion, asking questions as they arise,” the company said. Guests in groups ranging in size from two to seven will be met by their instructor/interpreter in the lobby of their hotel and will then travel to a restaurant located within a 30-minute drive by car. Once inside the restaurant, the instructor will serve as an interpreter and will also present lectures on sushi ingredients and, importantly, etiquette. Lectures are held at the counter where the chef prepares the sushi. The interpreter conveys the chef’s commentary on the cuisine to the parties, providing an introduction to the way sushi ingredients are skillfully formed, traditional lore surrounding sushi, the shop’s philosophy, and manners. For example, when taking sushi from a common plate, diners should turn their chopsticks around and take the item with the end that does not touch their mouth. They then set the item on the small plate in front of them, and turn the chopsticks around again before lifting the sushi to their mouths. That way, the common plate is kept sanitary. “Even if tourists do not speak Japanese, interpreting allows them to get to know everything about sushi and enjoy it to the fullest,” the company added. Another cultural nuance is photographing one’s food. As popular as that has become on Instagram, Twitter, Facebook and other social media in the U.S., most luxury sushi shops in Japan forbid photography. However, with its focus on overseas tourists and their preferences and habits, SushiUniversity has made special arrangements with the restaurants it uses so that tourists are allowed to take photos. “In this way, this service aims to go beyond cuisine and support tourists’ whole travel experience,” the company said. 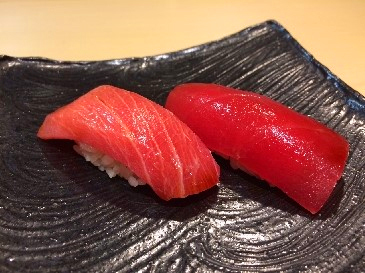 Because the aroma of the ingredients is one of the components that generate delicate flavors of Edomae style sushi, wearing a strong perfume is considered inappropriate in sushi restaurant. As well, smoking during the lecture is not allowed. SushiUniversity offers three courses at three difference price points: A basic course for ¥10,000 (about US$97 at current exchange rates), an Intermediate course for ¥20,000 and a Senior course for ¥30,000. All prices include the meal, interpreting service, the lectures, and shuttle service to and from the hotel. Guests pay for the service in cash when they meet their interpreter. On an etiquette-related note, it is considered rude in Japan to simply hand people money. Currency should be placed in an envelope before presenting it to another. Tipping is not expected in Japan but a gratuity – if also placed into an envelope – will likely be accepted graciously. More information on SushiUniversity is available here. Photos provided by Tabimori, Inc.